Once again, we are behind at our house in completing Cake Boys episodes. This week, the boys finally finished this video that they began last January. So many videos, so little time! You can see more of our boys’ Cake Boys episodes here. While there are already Season Two episodes in the works, this is the final episode of Cake Boys Season One recorded in 2012. Why yes it did take seven months to finish this (which is why you’ll see a Christmas tree in the background in one clip). That’s because the boys have too many ideas and not enough time. You should hear the commercial ideas they come up with. Be thankful they don’t make all of them for your viewing pleasure. I love their creativity though! Been waiting for your next dose of the Cake Boys? Here they are again, with another great cake, and another crazy commercial. Subscribers, click here to watch. Have a recipe you’d like me to try and make over? 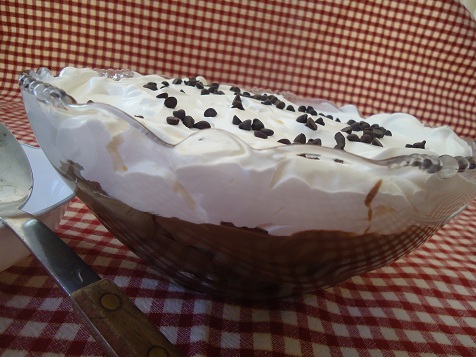 Submit your recipes on this Real Food Recipe Makeover Submission Page. Remember that cake I tried to make in a crock pot that ended up being tedious and difficult? 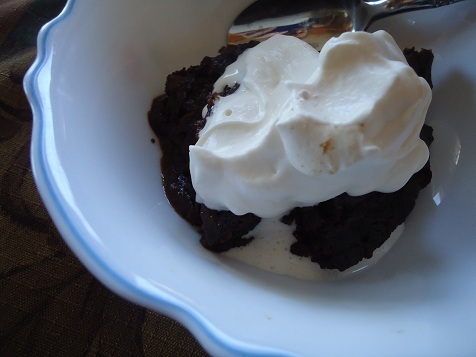 After that, my friend Jenny emailed me a recipe for Crock Pot Chocolate Peanut Butter Pudding Cake, figuring that I could surely make over the ingredients to make this a healthier recipe. I was excited, yet given my experience with cake in a crock pot, I couldn’t help but wonder: Would this cake be a lot of work? Would it be tasty in the end? The answer to those questions are: No, this cake is not a lot of work…and YES this cake is incredibly tasty. You simply pour the batter into the crock pot, then drizzle over a layer of boiling water/cocoa/sucanat. 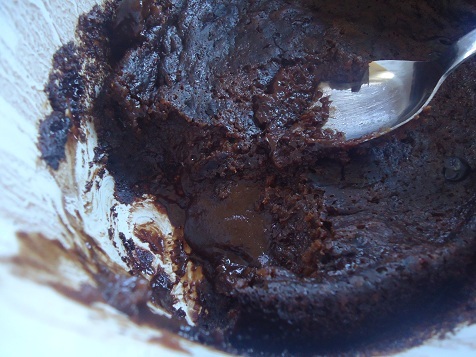 The cake bakes in a crock pot for two hours, and when it’s finished, the cake has baked over the top and a layer of fudgy pudding is on the bottom. This cake is dreamy, rich deliciousness. We all loved it! Mix cocoa and sucanat, whisk in boiling water until smooth. Gently pour over batter in crock pot, but don’t stir. Cover and cook on HIGH until puffed and the top layer is set, about 2- 2 1/4 hours. Turn off crock pot and let stand, covered for at least 30 minutes. Serve the cake (which is now on top) with ice cream or whipped cream and drizzle the fudgy pudding from the bottom over both. Remember how we hosted our church’s high schoolers for “Huddle” each Sunday night during the ’11-’12 school year? When school started this year, we were deep in the midst of Matt traveling many weekends for York College soccer, as well as being very involved in our city league soccer (Matt is currently president of the board) and of course our boys play and/or referee. I’ve talked about it plenty – you know our family eats, sleeps, and breathes, and loves soccer from August until November. During those months, we still wanted to be a part of Huddle, so we loved it that our friends hosted and fed the kids – and Matt and I just got to show up! Now that life has settled down a tiny bit for us, it’s our turn again! 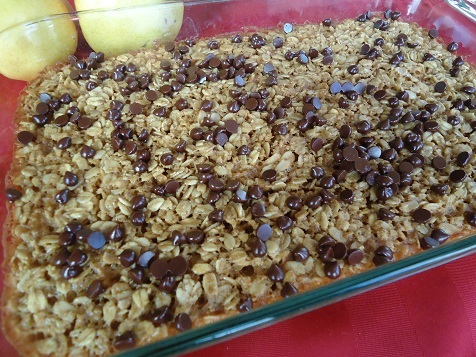 This morning I made Baked Oatmeal, using this recipe – baking it in a pyrex dish for about 25 minutes. I have loved reading all of your comments this week as you’ve been serving friends, family, church members, and neighbors this week. Thank you all for joining with me in this Funky Fresh Service Challenge. I know that many have been blessed this week because of you. God is glorified! If you haven’t yet had the chance to serve someone, join this challenge anytime! Our family had several friends over on Sunday for a meal and to play games. 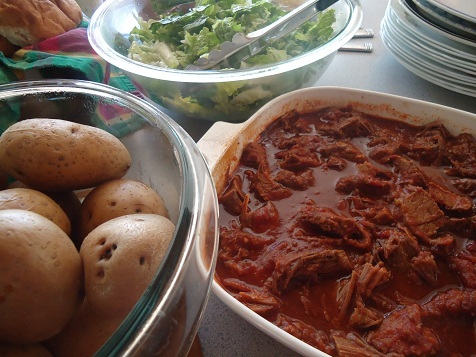 We served Barbecue Brisket, Baked Potatoes, Green Beans, Cream Cheese Corn, Tossed Salad, and Death by Chocolate. It was a blessing to have so many friends here, especially during our busy season. Taking time to relax, play games, and visit was just what we needed. Later in the week, our boys made cupcakes to hand out to our York College Ladies Soccer Team. They recorded another episode of Cake Boys during the process. Serving others is always a blessing to our family, and I’m so thankful that our boys are learning to experience this joy as well. I’d love to hear more about how you were able to serve someone this week! Leave a comment here to share. All comments will be entered in our giveway for two $25 and one $50 gift certificates to the Heavenly Homemakers Shop. Menu Plan for the Week…Plus Cake Boys Episode 3! And now, Cake Boys Episode 3! Here’s my menu for this week if you’re interested. If not, just scroll down saying “blah, blah, blah” until you get to the bottom so you can see the birthday cake my boys made for me!! It was so cute – I can’t wait to tell you about it! I don’t hold back on butter, I think butter has many health benefits, butter is real food, butter tastes awesome, and when I put butter on my bread or in mashed potatoes, moderation is not really a word that we can use to describe my portion size. I would never go so far as to eat a stick of butter by itself, because…yuck. And I do balance my butter with plenty of veggies and good protein. This is why, for my birthday, these creative geniuses (my husband and all four sons) came up with an idea to surprise me with a Butter Cake. 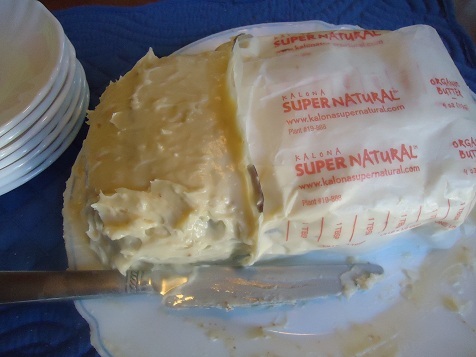 “A cake made with butter?” you ask. Well yes, there is butter in the cake. But how about a cake that is shaped and decorated like a stick of butter? How did they do it? Well, you can watch the newest episode of “Cake Boys” and see for yourself. And then you can see my reaction at the end of the video when I walked in and saw the surprise cake for the first time. I think I look quite ridiculous, but that’s how we all feel when we see ourselves on video right? Ugh. I also look quite sunburned. We’d been at the pool for swimming lessons that morning. The sunburn isn’t nearly as bad as it looks – I had just put coconut oil on my face before walking into the kitchen, so I was kind of…shiny. Oh, and the “drama” added to the video? The boys assure me that they were totally pretending and not really mad at each other while making the cake. Since the actual “Cake Boss” show often shows intensity and “heat of the moment” situations, my boys decided they needed to add that too. Love these kids.